Nerves are fragile and can be injured by many different causes — including compression, lacerations, or blunt trauma. Compression of a nerve is caused by prolonged pressure placed against a nerve, such as carpal tunnel syndrome. Nerve lacerations are often caused by a sharp object such as a knife or broken glass. A nerve can also be injured by a sudden forceful strike, known as blunt trauma or a “contusion”. Depending on the nerve injured, a patient may have a loss of sensation, a loss of muscle function, or both. Nerve injuries are diagnosed based on history and physical exam. Injuries to the blood vessels and tendons of the hand are also important to diagnose. In some cases, an electrical study (NCS/EMG) can help better define the injury and assess the recovery of the nerve. A cut nerve in the finger or thumb will make it very difficult to feel the tip of the digit. This is also associated with tingling and electric pain in the hand. What is involved with nerve repair in the hand? The surgery is performed as an outpatient in Raleigh either at our surgical center or local hospital operating room. During surgery, the nerve ends are brought back together and the nerve sheath, or epineurium, is repaired using fine sutures. This is called a “primary repair.” Surgical magnification improves the ability to see the nerve and its tiny internal bundles (fascicles). Injured tendons are also repaired if needed. Repair techniques have advanced over the past few years and outcomes for patients have improved. Nevertheless, many people do not regain 100% nerve function after nerve repair. However, my goal is to help each patient obtain the best possible result after this significant hand injury. 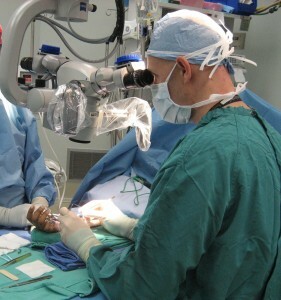 Here is a picture of a typical operating microscope often used in nerve repairs in the hand.